1 bed Apartment With Pool & air con In Peaceful Central location. Hermes Gardens is a fairly new small private complex which is very well maintained in a quiet Cypriot area just off Tomb of the Kings road. Tastefully furnished this 1 bedroom, 1 bathroom with bath & shower. The apartment has full air-con and ceiling fans, fully fitted kitchen with all the usual things you need in a home from home, toaster, microwave, toastie maker, fridge freezer with internal small ice maker etc., A lift to all 3 floors and entry phone system. Large balcony area overlooking a lovely overflow pool and large surround patio with ample sun beds in a lovely landscaped garden. pools side showers and toilets. Furnished to a very high standard, with a large bed settee in the sitting room. Also with free internet access, Sky Sat TV including the full Sky Sports package and a DVD player. We are Ideally located between the traditional old town and the bustling strip with an abundance of restaurants, cafes, pubs, shops and nightlife. Both only a 7 min walk either side of the small complex, the local Faros sandy beach is only 15 min walk (near the Kefalos Beach Hotel). Also within walking distance the popular and lively Bar Street with a mixture of clubs and night life near the newly upgraded Pathos Harbour, which is just a 25 mins walk along the beautiful paved coastal path or short bus ride away. Paphos airport is a 20 minute transfer and there are three Golf courses within 30 mins of the apartment. Coral Bay is a 20 minuet bus ride only 1.50€ Runs regular each day. There is the Tomb of the Kings ancient archeology site and the famous Roman mosaics to visit along with all the local history or visit the large water park which has buses leaving from the harbour daily at peak summer only, as well as harbour boat trips and water sports. We are Cathy and Ian and we stay in a small village just outside Edinburgh. We have a grown up son and daughter, and a lovely grandson. I work in childcare and my husband is a photo journalist. We went to Cyprus for the first time in 1996 and loved the island. We bought our property in Paphos 2006, off plan, and it was ready early 2008. We hope to be able to spend more time there once we retire and at the moment go twice a year as we love the great weather, visiting the many places of interest and its friendly people. This is an investment for us as I don't have a pension and have always worked part time since having our children who are now grown. We love the situation of the apartment as it is so close to the main strip and a lovely walk along the coastal walkway to the harbour, there are lots of nice walks and places of interest close by. The 2 apartment blocks that make up Hermes gardens are situated in a local area and the neighbours are really friendly, we know and visit a couple in the same street. We love the fact it is such a quiet area yet it is so close to the local shops and Tomb of the Kings road, we have become friendly with a few of the local people including restraunt & Bar owners of which we have some favourites but we also like to explore and visit some of the smaller villages and winerys all around Paphos. We are always finding great new places to see and visit. Also there is a good mixture of owners of the apartments Scottish, English, Swedish, Norwegian and Cypriot. With 4 owners living full time there which is good as they and the locals keep an eye on the place and keep us updated on all the news. They are very friendly and it is nice the locals take an interest in the visitors, making them feel welcome. You can relax and have a quiet time with no hassle or noise laying beside the pool or chat to the other owners who are always happy to give advice or directions if asked. Tiled bathroom with bath/shower and shower screen, WC, wash basin, shaving point, towel rails etc. Lounge/dining room, Air-con unit, 2 ceiling fans, leather fold down sofa bed, leather stress less chair, Sky sat , 32in flat screen TV plus DVD player, iPod docking station. Dining table with 4 leather chairs. Fly screens are fitted to the patio doors. Cooker with ceramic hob, cooker hood, full size oven with grill and roasting trays etc, fridge/freezer with ice-maker, washing machine, microwave, hand blender, toaster, kettle, iron and ironing board, granite work tops. There is skiing, snow boarding and winter sports available at certain times of the year. There are 4 courses within 30 mins of the apartment, the new Elea resort, Tsada/Minithis hills, Aphroditie Hills and Secret Valley. 2 new courses are under construction to be completed by 2010 with a further 8 in planning. Notes on accommodation: Our price includes a small starter pack, milk, tea, coffee, toilet roll etc. Enough to get you started. Though any extra items you would like have ready for your arrival can be there for you if ordered in advance and paid before leaving. All rooms have fly-screens, smoke alarms, full air-conditioning and ceiling fans. Apartment has free Wi-Fi internet access, Sky satellite system, 32 inch flat screen TV, and DVD player, Sky TV Channels including sky sports as well as free view channels. The Complex has overflow pool but no children's pool. The complex has off street parking allocated under the apartments. Apartment benefits from a property management service who are on hand to assist with any problems, calls during reasonable hours. 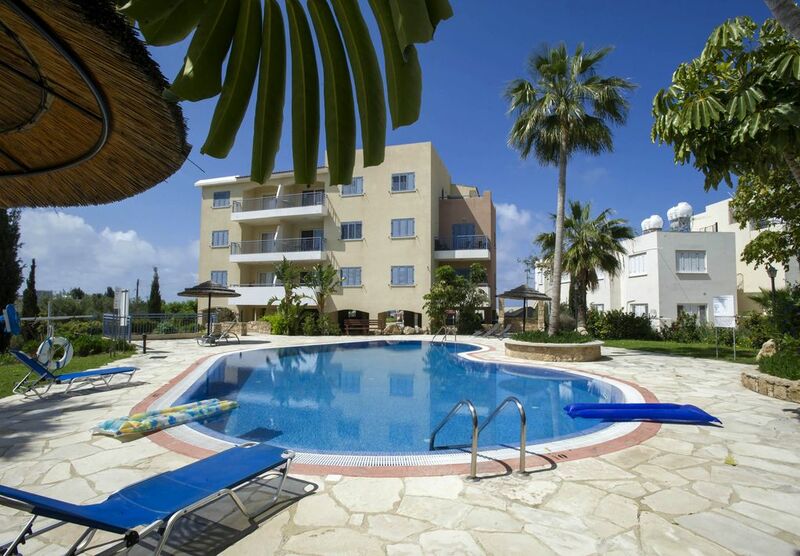 Outside: The small apartment complex is surrounded by gardens and has a large private over flow swimming pool for residents only, this also includes sun beds and sun shades which are free. Pool side toilets, showers and lockers are situated beneath the pool area. There is a Kiosk (mini supermarket) only 2 mins away, open early till midnight. A large supermarket is only 5 mins walk. The newly upgraded harbour area has a lovely paved walk way right along the sea coast past the Kefelos hotel and is a lovely walk from the apartment and takes about 25 mins. Cleaning / Towels / Linen / Maid service: Towels and linen are included. The property will be cleaned and a small starter pack included on arrival. Linen and towels (please use own towels for beach/pool). Linen can be changed weekly (extra cost 15 euros). There is a clothes airer and pegs. Other: Patio doors leading to large balcony with patio table and chairs with a view of the large overflow pool and gardens. The apartment has been newly fitted with Sky satellite, 32in Sky TV package including Sky sports and free view channels. Large apartment owners brilliant to deal with, a real home from home, great location near the Mall, Kings Road and the Old Town. Pool amazing water quality checked daily, great veranda for sun in morning overlooking pool, Wi-fi and all the TV channels if you need it, Aircon & overhead fan light in bedroom, Aircon & 2 overhead fans in main room so always a comfortable temperature. Friendly neighbours all you could want for a restful break, I have already recommended to a couple I met at the Irish Bar from Scotland. Would I stay here again without a shadow of doubt. The owners made the whole process from booking a pleasant experience. Previous reports of dogs are true but in my experience wasn’t a real nuisance. So to repeat if you are looking for a great location in a home from home apartment this is the place. Peaceful, good location, nice clean apartment! Myself and my partner stayed here for ten nights, easy access to bars restaurants and bus - 5 minute walk to the main road. Very good responses and communication with owners which was another plus. No issues with the dogs for us (they barked for about half an hour one early morning hit that was all we heard). Would definitely recommend. Clean apartment overlooking a lovely well maintained pool. Dogs barking incessantly on a couple of days was unfortunate however difficult to resolve. Thanks for your review. Unfortunately the dogs barking is problem for us, we have been trying to resolve this issue but as the dogs belong to residents outwith our Holiday complex its very difficult find a solution. We hope this did not impact on you stay to much. Thanks for your feedback, and we are glad you enjoyed your stay. We are sorry that you had problems with the barking dogs. This has been an off and on problem for all the residents at Hermes gardens for the last ten years. We have complained in the past and it did improve for a while but after hearing back from you and speaking to Graham we realise that it is as bad as ever again. When we arrived on Wednesday night they were barking on and off for a good long time after we went to bed. This is an unacceptable situation but one that is going to be very difficult to resolve. Today I went with Graham to the Police station to make a complaint, they then sent us to the Pafos Municipality where we registered an official complaint. It is now in the hands of their animal liaison team to go and investigate the owners of the dogs to see if they are being kept properly and warn them about the constant noise. We are not too hopeful that they will be able to do very much about it but at least we have tried. We would like to thank you for bringing the problem to our attention, although it did not come as a surprise. We hope this did not impact on your holiday too much, and we can only apologise for our noisy neighbours. The apartment is very comfortable with a balcony overlooking the pools and hills beyond. The kitchen was well equipped for cooking and includes a washing machine. Everything in the apartment worked well and was maintained to a high standard. Access was via a key in a key safe that enabled late arrivals. For most of the week we either walked to sites in Paphos or took the bus to Polis. We hired a car from one of the local firms and went to Mt Olympus, the Avakas George, St Neophytus Monastery and Letymvou. Car travel is easy for Brits on the left. Many of the apartments are owned by expats who are all friendly. My wife and I stayed for a week in February 2018 so we were in a quiet part of the year. Thus, many of the restaurants in Pafos were closed. However that didn't detract from our enjoyment of getting to know the south-western part of this beautiful island. We had flown to the island with Ryanair and booked a car for the week with Payless via the Ryanair website. The car was just around £75 for the week and that included picking it up and dropping it off at the airport. We were even given an upgrade and the automatic Nissan was comfortable and easy to drive. The apartment was comfortable and had all we needed to spend the week there. It had a view over the swimming pool but we didn't use the pool as the weather was cool and blustery during our stay. The TV had access to a good number of English TV stations and loads of international sport channels so any football fan won't leave the apartment with withdrawal symptoms. Strangely, the TV didn't give us any access to Greek or Cypriot TV channels and it would have been nice to have seen the occasional one; if only to see and listen to some local music. If you are thinking of coming to Pafos and want a decent apartment in a good location and at a fair price, you do not need to look any further than this one. One thing I must add is the friendly and helpful attitude of the owner Ian. We never met him but his communications were always extremely helpful from the day that we booked to stay. The sandy beach 15 mins walk and is next to the Kefalos Beach Hotel it has great views of the lighthouse and 95 hectare Archeology Park all along the coast with mosaics of gods, goddesses monsters and myths. Also there are a few other sandy coves all along the coast towards the popular Coral Bay area which is a 12 mins drive from Paphos, the local buses are cheap and very regular all along the coast. Paphos airport is 20 mins away. A car is useful for sight seeing around the island but is not a necessity for the location of the apartment which is central to both the old town and the main Tomb of the Kings strip. The local buses and taxis are many and very reasonably priced. There are now direct flights from Edinburgh to Paphos which have just been released by Easyjet priced from £32.00. Coral Bay is approx 7km. Tomb of the Kings historical site is approx 1km. Paphos Harbour approx 1km. Paphos Water Park approx 3km. Limmasol approx 1 hour’s drive. Nicosia approx 1 1/2 hour’s drive. Banks all along the main route and in the old town only 7 mins walk. Restaurants, supermarkets and shops all within 10 mins walk. Bar Street and clubs all within 20 walk. Booking Notes: 20% deposit on all bookings. Please email. Paypal accepted. Changeover Day: We are flexible on change over dates and also departing and arrival times. Notes on prices: Prices are for the property per week in UK pounds. For more than 2 weeks please e-mail owners.